That last thing you’d expect driving along the minor road from Bicske to Csákvár in northwestern Hungary is to be catapulted back to July 1931. But there it stands in the middle of nowhere in all its glory. 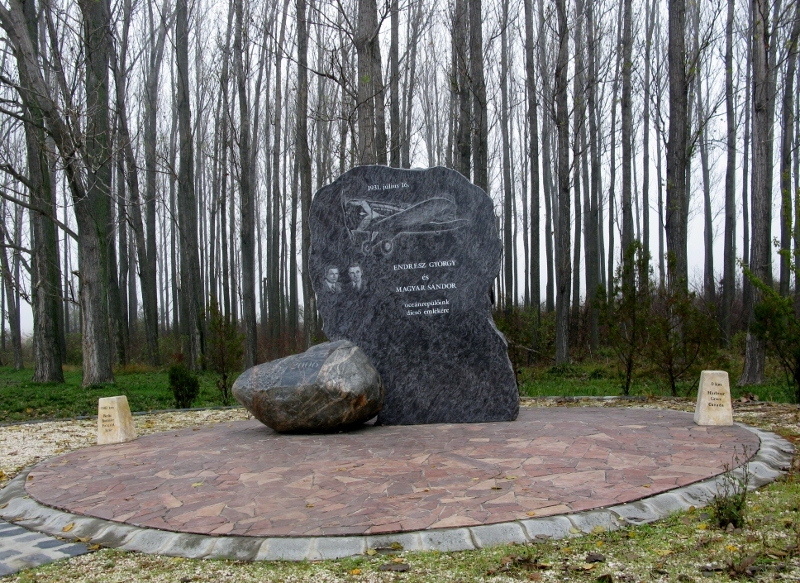 A monument to two Hungarian pilots – Magyar Sándor and Endresz Gyorgy – who flew across the Atlantic Ocean from Canada to Hungary in a Lockheed-Sirius airplane to focus the world’s attention on the ‘dismembered’ state of Hungary in the aftermath of World War I. Their non-stop flight took 26 hours and 20 minutes and included a number of firsts: the first time with radio contact at the start and at the finish (don’t we take so much for granted these days?) and the first time a flight was used for political purposes. The boys were a couple of days late starting from Harbor Grace and a couple of gallons of fuel short of reaching their target – Ferihegy Airport in Budapest. Just 12 miles from their destination (as the crow flies, obviously, as it took a lot longer by road!) they had to crash-land. Both escaped unharmed. But although the 100 000 people waiting in Budapest were left waiting, the boys were welcomed home as heroes. I can’t help but wonder how many other monuments there are scattered around the country, bearing silent testimony to great deeds done … and all but forgotten. Good heavens, how ever did you discover this?? I’m going via Bicske to the Pilis shortly, so I’ll go that way and take a look!. 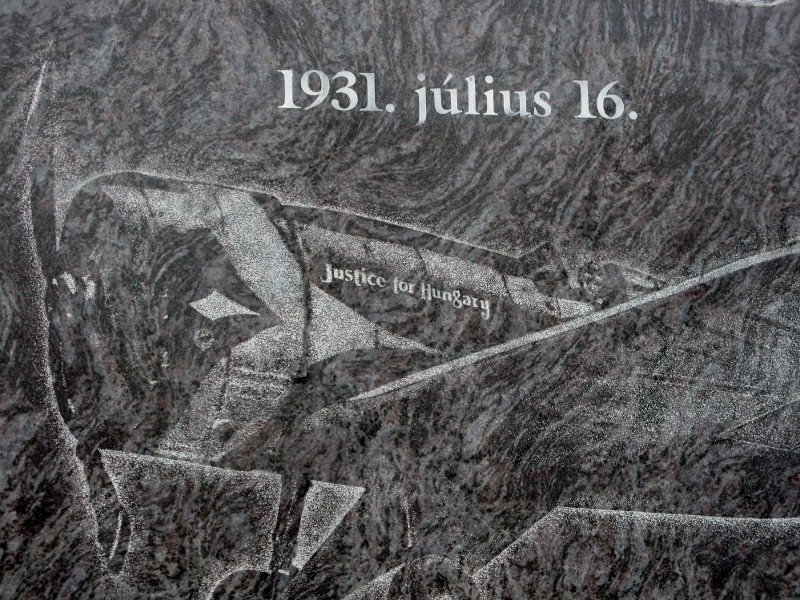 Presumably this is not the spot where the forced landing occurred – it’s a lot more than 12 miles from Ferihegy. Mátyásföld was the original destination – not Ferighegy. This was the first Bp airfield, 9 Km east of Keleti p.u. not so far from Ferihegy, which replaced it in the 1920s. Now inside Budapest, it remains a grass airfield, no good for modern large aircraft. – Thanks Bernard! Did you know the plane likely had sufficient fuel to complete the flight…but the pilot may have been tired….or perhaps not entirely familiar with the new plane…and neglected to switch fuel tanks back and forth….or something like that ? Of course this could be post falling out rhetoric from the navigator Sandor Magyar. The pilot…while a national hero….was not known among the relatively small fraternity of flyers at the time for being an outstanding pilot…..and he eventually crashed outside of Rome having been invited by Mussolini. Fascinating Lorand … thanks for sharing. I know a few people who will be interested in your comments.